Me, my sister Daphne, Diana Gabaldon, and Andrea Patten at the Amelia Island Ritz Carlton during the Amelia Island Book Festival Gala. Loved meeting and interviewing Diana, she is amazing! Keeley Stephenson and her son stand outside a door installed by the 1st Earl of Strafford in 1630 in his family home and the largest private residence in England: Wentworth Woodhouse. She holds The Earl in Black Armor which features Strafford on the cover. The book now has a place in the library there. 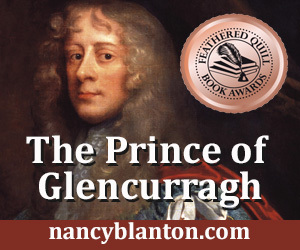 Reading from The Prince of Glencurragh, August 6 launch. Tracy and Donna, participants at recent personal branding workshop. Awarded by the Florida Authors and Publishers Association, August 2016. Excellent example of 17th century lifestyle, recommended by Lucy Worsley. 2001 promo pic with co-authors Terry Nosho and David Gordon, for Heaven on the Half Shell, the Story of the Northwest's Love Affair with the Oyster. Sampling oysters at Seattle's Pike Place Market. First visit to Ireland at age 14: is it any wonder I'm still writing about it? Receiving the gold medal from Mark Wayne Adams for The Prince of Glencurragh, August 2017.